« HFL Poll: In 5.2 What Class is Your Main? Reaching into the universal bag of cliches, I find myself repeating the phrases “Best Intentions” and “Looked good on paper” over and over again each time I see any other player in game with a character name ending in the asterisk that signifies a tourist from another server. Anyone that has listened to the last few episodes of the Horde for Life podcast knows my disdain for a technology that was created – at least in part – to avoid the PR nightmare of merging servers. However it is important to note here that I am not opposed to the technology, I am opposed to its implementation. An implementation which in this authors opinion is quite possibly the most misguided application of a technology since in game voice appeared in game. I should also preface the remainder of this article by stating for the record that I call a higher population server home. A server with a strong economy and that can certainly bias one’s opinion. That said, the CRZ technology in and of itself has potential in targeted/instanced areas such as realID zone invites and in more global facets much the same way LFR, BG battle groups and looking for dungeon has opened the game up to the majority of players. So despite its awful current form, I have hope that the functionality will someday lead to an overall improvement of the game as it assists with downstream and future mechanics to leverage the games population across all servers to enhance the game as a whole. However this article will focus on the here and now and the problems that the current CRZ application creates. To talk about cross realm zones, we must first address the War Mammoth in the room, low population servers. I recently rolled a “test” character on one of the lowest population servers in North America and can confirm that the single biggest issue for those worlds revolves around the economy. If CRZ was designed to help low population servers then you have to ask why Blizzard created a technology that does absolutely nothing to help or even impact what is the single biggest issue on those servers. To make matters worse, CRZ seems to be applied in the most arbitrary and uneducated of ways. I took my low population test character to the fine city of Stormwind, placed him the heart of the bank/AH area and noted in the span of 60 minutes that I saw ONE other character and a grand total of 4 messages in trade chat. Compare that to your server and you may well see another large problem facing the dead servers. Again I must ask, why would a technology designed to help lower population servers not be applied to their capital cities? Forgetting for the moment that there is no way CRZ can assist those economies with Auction House impacts, at least seeing more than one person in the entire city would make the server “feel” more active. So we have established that CRZ does not impact the economy in any way and we have confirmed that CRZ does not place any foreign players in the capital cities of low population servers. So where does CRZ become active? Why in the starter areas of course! Wait… what? why? That is right, for some unknown reason the technology will not fill the ghost towns of Orgrimmar or Stormwind, but roll a new toon in Deathknell, Gilneas or any of the other starter zones and you will find yourself in a sea of asterisks, mob tagging and character clipping to make you think the game just launched. Is this what Blizzard thinks makes a server feel active? Fighting for mobs as a level 1 in an area that was DESIGNED to be a solo experience? Couple this with the well known and documented crowded farming zones (arguably one of the few former good aspects of a low population server) and you can plainly see how CRZ not only fails to address the issues facing dead servers but it actually takes away any benefit to playing on those realms. 4. CRZ floods farming zones with players who take those mats back to their server not the dead server economy. 5. CRZ floods quest zones at a time when Blizzard has removed most group quests. Can someone tell me the benefits of such an implementation again? It should be noted here that Blizzard has already developed and implemented technology that mitigates 90% of what would be real problems on low population servers when they created the battle group and cross server functionality we use everyday to queue for dungeons, raids and PvP. The real problem here is that CRZ should be used to assist or at least give the impression/feeling that you are not alone at times when it is most obvious and depressing, for example when you are the only one standing in an entire capital city… NOT when you are happily farming your favorite herb or ore zone or enjoying the starter quest story lines. CRZ is poorly implemented and helps next to no one, regardless of server. The ability to invite your friends to share your server is the only redeeming and quite excellent aspect of cross realm zone technology. Lets leave that in place and turn the rest of CRZ off. In its place, Blizzard should bite the bullet and offer free transfers to low population servers. Too many people are stuck with not one but 5, 10 or more characters making $25 per character transfers cost prohibitive and incredibly unfair. The net result of this effective change would be an ever so slight drop in transfer revenue, potentially offset by the goodwill and subscription retention that cannot be logged on a balance sheet. In closing, Blizzard… if you are nervous about closing servers, don’t fret… you can always take those dead servers, after free transfers, and turn them into classic “vanilla” rule set or old school world PvP (aka no guards with nets) servers! This entry was posted on March 13, 2013 at 10:38 pm and is filed under Economy, HFL, MMO, Podcast, World of Warcraft with tags Blizzard, Games, MMO, Podcast, Warcraft, World of Warcraft, WoW. You can follow any responses to this entry through the RSS 2.0 feed. You can leave a response, or trackback from your own site. I agree that CRZ does not help low pop servers in terms of economy, and I agree that CRZ not working in SW/Org is a mistake(not just inactive by default, you cannot have invited friends present). However, where was it stated that CRZ was intended to help low pop servers? The only reason I recall being given by Blizz is to make the world feel more alive. I play on a medium pop server and whenever I would level an alt the low level zones were dead. Now, I see other players and it actually feels like I’m playing an MMO rather than playing through a dead zone with no activity. If the goal was to make the world feel alive – mission accomplished. Sure we can all speculate and say that the ‘real’ reason was to not have to shutter realms and avoid the PR fiasco of ‘WoW is dying’. And there may be *some* truth to that, but I don’t believe it’s the PR fiasco they’re trying to avoid. I think it’s more along the lines of avoiding having to force people to rename their characters/guilds. They’re concerned with players reacting negatively to model updates, what do you think the reaction would be to losing a *name* that they’ve had for 8yrs? They just started offering high->low pop server transfers. They do this from time to time, as I’m sure you’re aware. However, I don’t believe they’re as successful in increasing the population on those low pop servers as many think. Sure, it probably helps some, but it doesn’t ‘solve’ the problem. Most players I’ve talked to who have paid to transfer are migrating towward higher pop servers since there’s more chances for getting into a raid compared to lower pop servers. 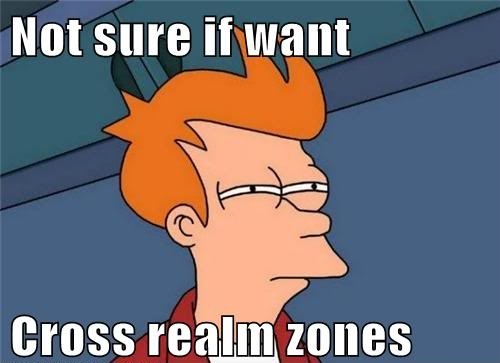 i agree that cross realm zones do more harm than good. i wish they were removed and i do not really even understand what the point of them are! I personally think that they should just create a bulk server / faction transfer option so you can move all your characters at once. They could then offer this service to all players for free once every 6 months. A 6 month window would stop abuse and give players a saftey net so if they do move to a server they don’t like they can simply transfer to a different realm in a few months. Players could still use the paid service if they need to transfer more frequently.